In this story, Gilroy Goat is the bully. The author describes different ways that a bully can be a bully. A bully can tease, call names, knock down toys, laugh and snicker, throw things, kick and be mean. 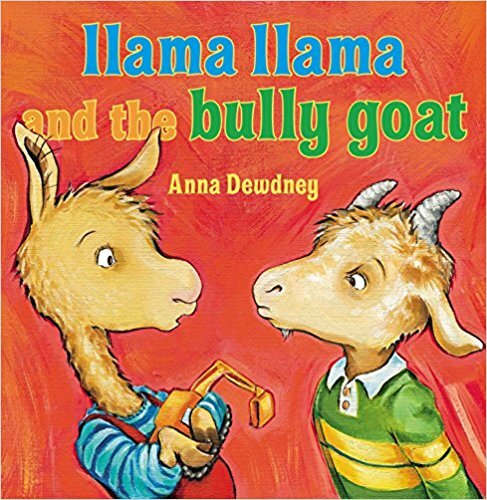 The author goes how things Llama and his friend can do when they are being bullied, such as tell a teacher or a grown up. The teacher eventually had enough of the bullying and Gilroy Goat gets a time out and the teacher asks Gilroy Goat if he can be a friend and reviews how to be friend. Gilroy Goat gets invited back to play and showed great improvement in how to be a friend and play nice. I purchased this book when my kids had a little bullying going on in my house, just a little push, knocking something down or grabbing something that doesn’t belong them. It was horrible, but it was important to find way to stop this bad habit immediately. This book did the trick. I like how the author goes over things that a bully does, because sometimes, children will take part in certain behavior and not even realize it falls in the bullying category. I like to go back and refer to this story overtime one of the girls may decide to be a bully for the moment; and remind them to be kind. I love how the book tells the children what they can do if someone is being a bully to them and how at the end, the teacher explains how friends should play with each other. I highly recommend this book to anyone who may be going through a bullying scenario.